(Photo Credit: Top Rank/Chris Farina) Manny Pacquiao (54-5-2, 38 KO’s) successfully made weight today for his fight for the vacant WBO International welterweight title against the younger 27-year-old Brandon Rios (31-1-1, 23 KO’s) for their fight on Saturday night at the Cotai Arena, Venetian Resort, Macao, Macao S.A.R., China. Pacquiao weighed in at 145 lbs., and looked in great shape. Rios came in slightly heavier at 146.5. The Rios looked, he appeared to be a little drained, and it seems like he’ll rehydrate quite a big by tomorrow night. I wouldn’t be at all surprised to see Rios coming into the fight with a 10-15 pound weight advantage over Pacquiao tomorrow night. Rios is definitely bigger fighter here, and it’s going to be interesting to see what he can do with his superior size. He won’t have the speed or the experience advantage, but it’s very possible that he could make up for that with his size and youth. He takes a great shot and he’s getting the 35-year-old Pacquiao at the ideal time with him coming off of a knockout loss to Juan Manuel Marquez, and not having looked good in many years. The last fight where Pacquiao really shined was against Miguel Cotto in 2009. It’s been downhill for him ever since with Pacquiao looking worse with each fight. Whether that be because he’s juggling many things with his life or the product of the wear and tear of his many ring wars is unclear. But what is clear is that Pacquiao is no longer fighting like he used to. Saturday’s HBO Pay-Per-View event airs live at 9:00 p.m. ET / 6:00 p.m. PT. HBO Pay-Per-View airs live coverage from CotaiArena. 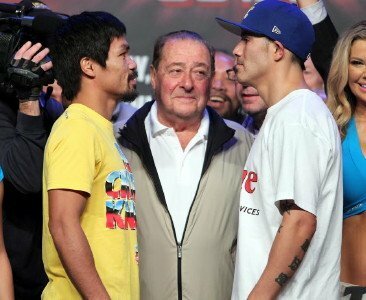 Saturday’s main event is a 12-round welterweight showdown featuring Manny Pacquiao and Brandon Rios.